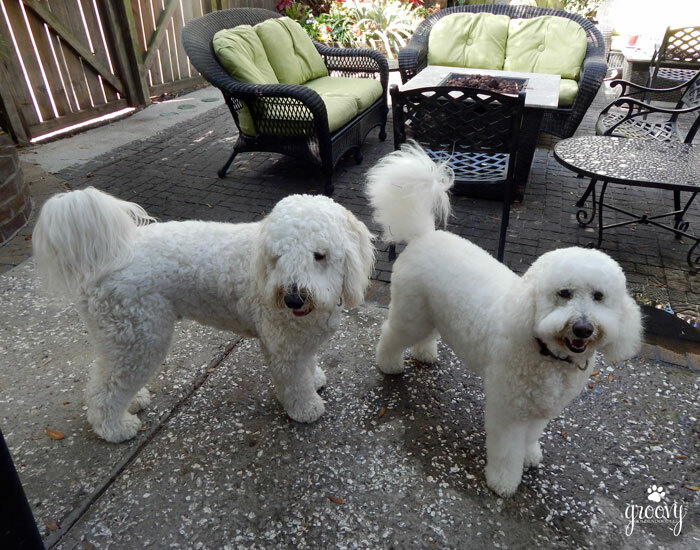 I live with two tail wagging Goldendoodles and one tail wags all the time. Humans generally associate happiness with a tail wagging dog. The appearance of their tails AND the reasons behind when they wag them intrigued me. 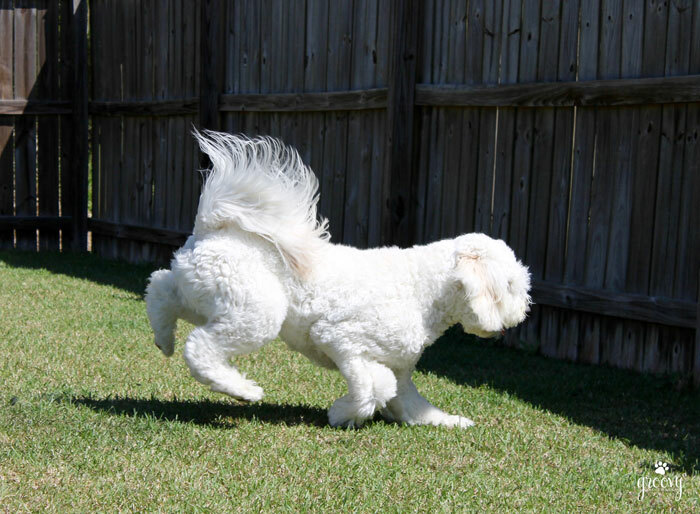 The tail of a Goldendoodle can be a beautiful plume – either curly or smooth. 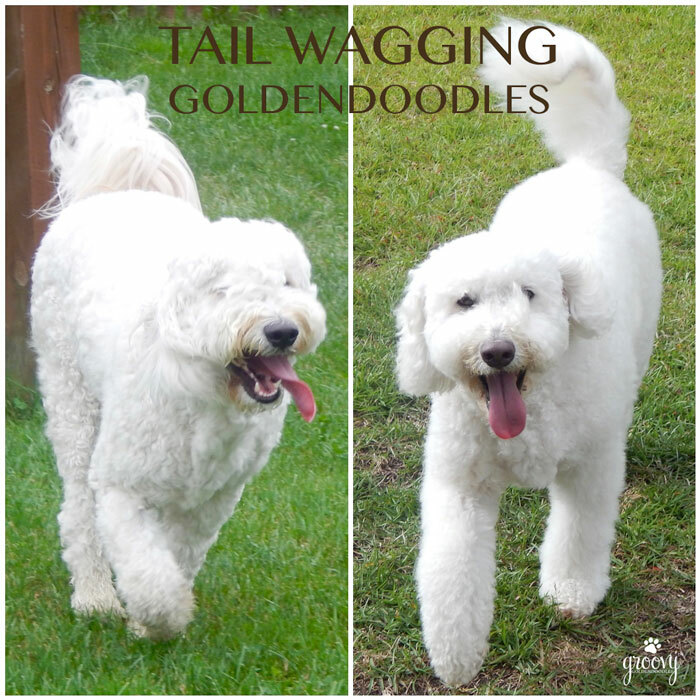 Goldendoodle tails ride high up over their backs then slightly curl over. 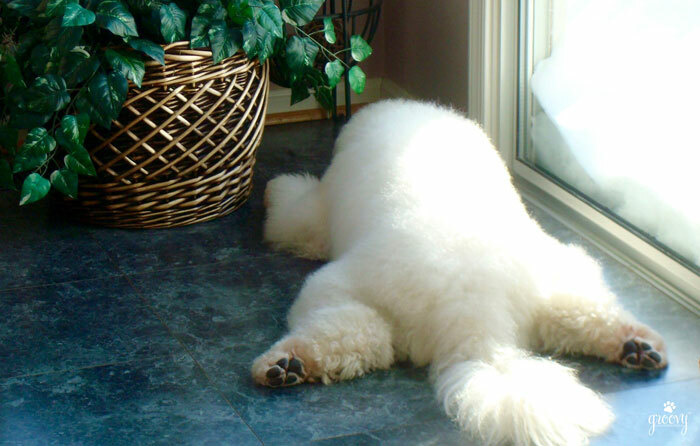 This is a very common trait of the Goldendoodle. But yet, when you look at Harley and Jaxson the dissimilarity is easy to spot. Many times during the course of the day Harley’s tail is relaxed and laying down. But Jaxson keeps his at attention. straight up, curled over with long strands flip flopping as he walks. Is Jaxy happier than Harley? #nope! While we associate tail wagging with our dogs mood, there are many other reasons why they wag their tails. AOL News aired a video titled “10 Things You Likely Didn’t Know About a Dogs Tail” and trust me, there were a few things I was clueless about. Numbers 7 / 6 / & 5 blew me away. Research also states that every canine understands the meaning in a left or right tail wag from another dog. Did something in particular on that list surprise you? Hop on over to our post about the Tether Tug Dog Toy giveaway and register to win a free one. We’ve heard most of that before, but had no idea dogs don’t wag when they are alone. Bailie is a serious wagger, but she is also a huge tail thumper. We still wonder what that is all about! Fun post! Jaxson is a thumper too! As a matter of fact my daughter and I thought long and hard about changing his name when he was about 6 months old. Oh – how I wish we lived closer, you and Harley could lounge around while Jaxson and Bailey played 24/7. Katie could chill with the humans! I know that my dogs wag their tail when they’re a bit nervous; which surprised me, because I used to think all tail wags were a good thing. Great post and thanks for the video! Love when you find these gems. I too had no idea the tail played such a major role in expressing different emotions. Did you find out the direction of their tails yet? Your welcome – happy you enjoyed it! Don’t be – your tails are PAWfect for both of you! Thanks Robin, I would like to think they are happy:) On occasion when Harley is standing still his tail will relax and lay down, but that’s rare. Youve got me curious now. Charlie’s lays to the right and Baxter’s lays to the left side. Both are always fanned up onto their backs, unless upset/scared/angry. When Charlie wags his tails, it’s a full arc, right to left to right to left, brushing the top of his back. When Baxter is happy, same but he does a bashful/silly wag where he does just the one side. Well right to left wagging is a good thing (according to my findings!) I didn’t find anything that covers information regarding which direction it lays – so I believe you’re safe 🙂 #noworries. Jaxson’s tail opens up like some sort of flower and plumes downward so I have no idea which side it rests on. Ruby is a Yorkie-Poo and has very curly tail. It pretty much never stops wagging. Sounds to me like Ruby is one happy pup. Is it wagging from right to left? Thanks Kia – how have you been? You’re not alone – trust me. I was like “say what?” Happy to hear you enjoyed it!